Payments are increasingly important in the overall commerce and sales equation. Merchants that see payments as a strategic asset rather than a necessary utility tend to be more successful than those that do not. This payment focus raises the bar significantly for acquirers. Companies require their payment provider(s) to support their cross-border business, to manage payments over all channels, and to provide superior experiences for both the merchants and their consumer clients. At the same time, acquirers are facing increasing competition from peers and from new entrants, leading to strong margin pressure. 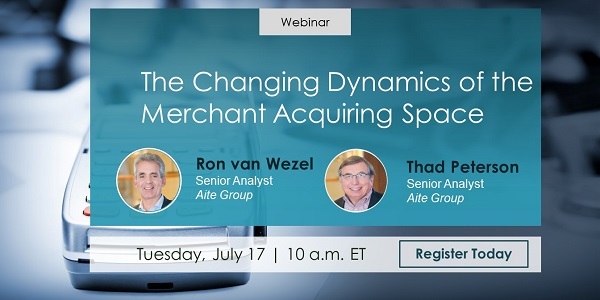 Aite Group senior analysts Thad Peterson and Ron van Wezel highlight the changing dynamics of merchant acquiring, based on the results of their recent research in this space. Clients of Aite Group's Retail Banking & Payments practice can access the full webinar on-demand by logging into our website. Ron van Wezel is a senior analyst for Aite Group’s Retail Banking & Payments practice. His research covers market and regulatory trends in the payments space, with a focus on Europe. Mr. van Wezel is a renowned expert in payments and digital banking. He brings to Aite Group 30 years of experience in product development and innovation, advising clients on a wide range of topics including mobile payments, digital wallets, cards issuing and acquiring, and ACH solutions.